Notary also known as a Notary public in common parlance is a qualified and experienced lawyer appointed by the state or central government on the recommendation of courts under the provisions of the Notaries Act, 1952. who can give an oath to a person and declare the Legal document like affidavits and contracts produced before him as authentic, by affixing his seal and stamp on it of course by charging some officially prescribed fee under provisions of notaries act, 1952. 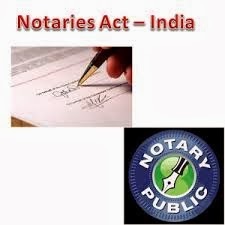 The standing of Notary Public can be granted to any Lawyer or member of Indian Legal Services. It is to be noted that, No Legal Training is required to apply for Notary Public. However there are some requirements or eligibility criteria before to apply for Notary Public. Ø An officer in the dependent of judge, Advocate- General or in the armed forces.